By properly taking care of your furniture you can help extend its life. Most people don’t spend a lot of time on their patio in the winter, depending on the severity of the weather in your location, so storing your furniture is a good option. The first step to proper storage is to clean your furniture. Any moisture or debris left on over the storage period can cause damage. Mold is probably your worst enemy in this fight. Mold can spread fast and will seriously compromise your furniture. If your furniture is made from any of these materials: wicker, mesh, plastic, or wrought iron, cleaning is fairly simple. All you need to do is combine some dish soap and water. Use a gentle cloth to wipe away any all of the disturbances. If you furniture is made of wood, you may need to take some extra steps. To being you can use some Murphy Oil Soap combined with water. Once you’ve applied this mixture, you can rinse the furniture and allow it to dry completely. If you discover your furniture still has some persistent stains, you can use an additional mixture to resolve the issue. Mix 1 cup of ammonia, ½ cup of vinegar, ¼ cup of baking soda, and 1 gallon of water. Apply the mixture with a soft brush directly to the stains. Once again rinse the area and allow it to dry completely. It is best to address these stains now rather than wait until spring. The storage period will only make them more difficult to remove. If your patio furniture makes use of cushions, this is another element which needs proper cleaning and storage. If the cushions are covered in either fabric or canvas, you will need to create a special solution to clean them. Combine ½ cup of Lysol and 1 gallon of hot water. Grab a soft brush to scrub the cushion clean. Once again, rinse them and allow them to dry thoroughly. If your cushion has fallen victim to a more serious stain, you can try ½ cup of bleach combined with 1 gallon of water. But, it is very important to test this solution on a small area of the cushion prior to using a large amount of it. Some cushions respond well to this solution, but others may suffer discoloration or other problems. Save yourself some unexpected hassle and test a small area first. Now that your patio furniture is clean, you are ready for the next step: Protection. You can protect your furniture by giving it some kind of coat. For example, aluminum or plastic pieces may be coated in a thin layer of car wax. For wicker furniture, you can utilize paste wax to achieve the same effect. If your patio furniture is made of metal, you need to begin by checking that there is no rust. If you find any, make use of a wire brush to remove it. Once this is complete, you can spray the metal with a silicone sealant. For even more protection, consider getting a furniture cover. These are great for really encouraging the health and longevity of your furniture wherever you choose to storing them. They are a must for anyone choosing to store their furniture outside, but are also strongly recommended for those who choose to store in a shed or garage. These covers come in a wide variety of shapes and sizes. You’ll also be able to choose the thickness of the cover material depending on whether you want to store the furniture inside or outside. Whatever your specific needs are, you’ll be able to find a cover to meet them. 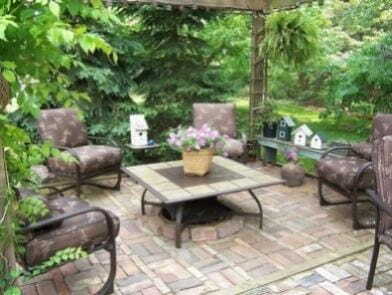 If you aren’t sure what patio furniture to store and what can stay, remember whatever you elect to stay will be under considerably more strain than what is properly stored. In particular, if you have any mosaic tile furniture, it is essential that you store it. The winter months can cause fluctuations in temperature which can cause the mosaics to break apart. Prevent this from happening by storing it in a safe place. Investing some time and effort into properly storing your furniture is well worth it. You will be able to enjoy your furniture for a longer period of time and at a higher level of enjoyment if you take care of it. Remember the most important points are properly cleaning the furniture and achieving the best level of protection. Just throwing the furniture into the garage may not be the optimal level of protection for your pieces. But with the easy steps mentioned here, you are sure to extend the life of your outdoor furniture.